For the month of June I was very pleased to be given the opportunity to guest host Pasta Please for Jacqueline from Tinned Tomatoes. On Jacqueline’s blog you will find lots of delicious vegetarian and vegan recipes, so do visit and take a look. I cook pasta a lot though it tends not to make its way onto my blog since I tend to focus on slow cooker recipes and let’s face it, cake. 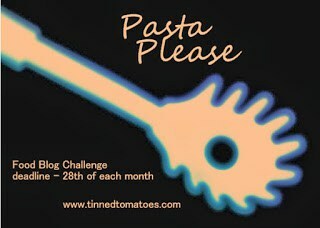 This month I will certainly be entering the challenge so expect to see a pasta dish from me soon! The challenge is open, there is no theme, so please link up any dishes containing pasta. As I am not vegetarian you can also link up meaty dishes this month if you like. You can find the roundup of the tasty pasta dishes entered last month here on Jen’s Food. Post your pasta dish on your blog and add it to the linky at the bottom of this post. Link to BakingQueen74 and Tinned Tomatoes. Use the Pasta Please logo in your post. If you use twitter, tweet your post with @bakingqueen74 and @tinnedtoms and #PastaPlease and we will re-tweet it.